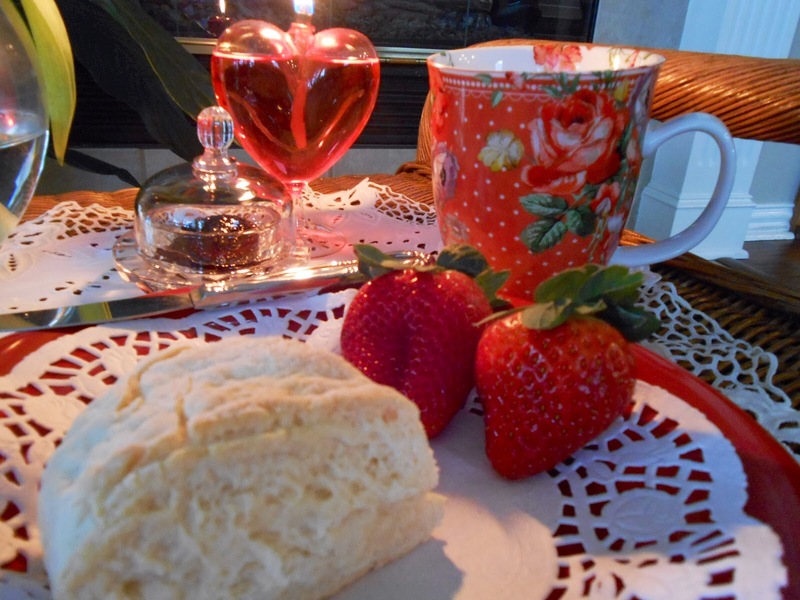 I am having some camomile tea, fresh strawberries and a scone with Blueberry Lavender Jam. A sweet blogging friend sent me the beautiful toile bookmark that she made. The tulips send a cheerful message that Spring will soon be here. I am using my Katie Alice mug that I received from Vee, at a teacup/mug exchange that Stephanie had, awhile back. If you'd like to participate, Stephanie is having one again, and you can read about it at The Enchanting Rose. 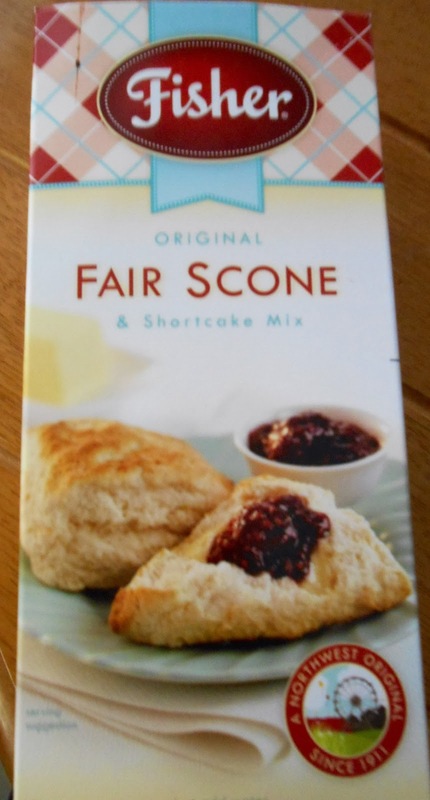 No, these scones are not "fair" tasting, they are named "Fair Scones", dating back to the early 1900's. The scones are a signature food attraction served at state and local fairs across the northwest. My dear friend/neighbor, who said these scones were always a favorite of hers, brought me a box of the mix, along with a jar of Blueberry Lavender Jam, from her visit to Seattle. The mix contains 4 cups and there was a recipe on the back for making waffles, besides the scones. I decided to measure out 2 cups and make half scones and half waffles. My son that is here with me, came out when he smelled the homemade goodness drifting through the house, and sampled the waffles with some strawberries on top. Maybe some of you from the Northwest have tried this wonderful mix? Beautiful mug, perfect for a nice cup of coffee or tea. I like chamomile tea too. I buy the honey vanilla from Bigelow. Your scones look great, Kitty. So do the strawberries. This makes a nice breakfast or snack. Have a good week, Kitty! Kitty, this is a beautiful tea setting. I love it all. Love that darling mug you received from Vee, and I love your heart-shaped oil lamp. I've never seen anything like that! Your toile bookmark is so sweet; what a thoughtful gesture from your friend. It looks like many of us were on the same page this week when it comes to flowers; I have tulips on my table, too. :) I've seen at least four or five blog posts with tulips in the past few days. They are so cheerful, aren't they? Your scones look yummy -- I've never met a scone I didn't like. I hope you're staying warm and I hope you have a good week, my friend. It sure all comes together in a lovely way! The scone looks light and delicious. Your scone looks delicious, and what a pretty mug to go with it. I love it when my boys are home and I can make them something special! What a pretty tea table, Kitty! The red is so bright and cheerful. A happy colour! I love your mug and red tulips and those scones look wonderful too. I was thinking about you over the weekend, wondering how you were doing. I think of you often these days. Sending you hugs and thank you for coming to tea. I arrived at Sandi's party just after you Kitty! That's such a cheerful tea time setting to warm your wintry days! Oh how I would love to join you in a cuppa and one of your delicious scone - we would have a good old chinwag I know! Lovely to know you have your son with you. Love it Kitty, beautiful setting for your cart. The scones look delish and strawberries are perfect to eat. The red and white are just stunning in your pictures. You've put together a sweet little tea table and I remember when you received your mug from Vee, it's pretty and holds a good amount of tea. I may have to check out the exchange as I haven't participated in one for a couple of years. I love your setting, specially that lovely and pretty mug! Wish I had a scone for a cuppa tea too! Have a lovely week sweet lady. Such gorgeous tulips!!! They really stand out! I've never heard of this brand, but my Mom may have. She is a big scone lover and picks up different ready mixes from wherever she travels. It's net that you were able to enjoy all these beautiful gifts from so many wonderful friends! Have a terrific week, Kitty! Everything looks so, so pretty! I adore tulips ~ always love when they're available. The scones look delish and I'm sure they are. That mug is really pretty. I would be drinking some coffee out of it in the mornings! What a sweet table setting and tulips! Scones are a favorite of mine and the sounds good. I remember making A rosemary scone that you featured on your blog a while ago. It was delicious. Very informative and helpful content . You have nice command on the post and have explained in a very great way. Cardsharing Server Thanks for sharing.Nice work,hope your blog be better!I just want to make a blog like this! What a cheerful table you set. I love the reds and that candle is perfectly darling too. Oh delicious! Scones, jam and chamomile tea! I love all three! You have set a cheery tea table. Your tea mug is vibrant and gorgeous! 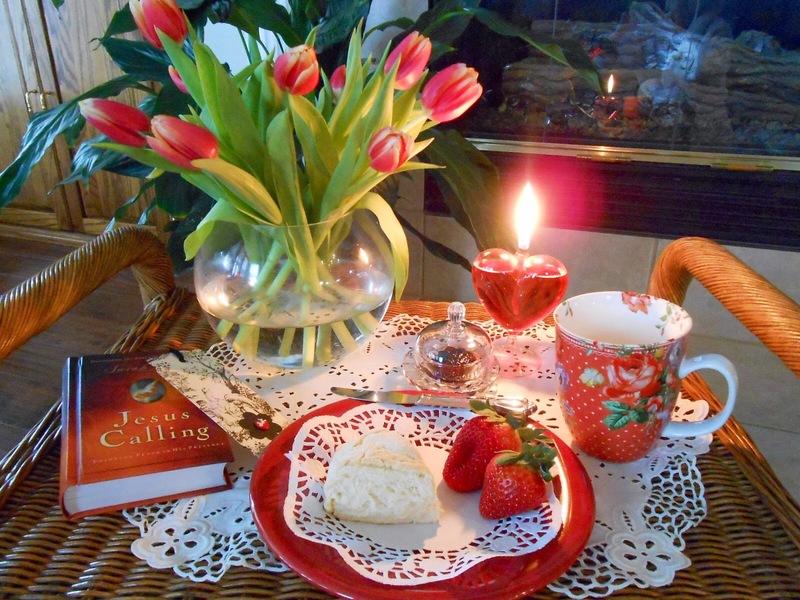 A beautiful tea time, the scones sound awesome, and it is a beautiful post. I *adore * the mug Vee choice to swap - it is so perfectly YOU! Your tulips make the whole space cheerful, and I am very pleased to know your son was there to share this special time with you. Hugs and blessings. Kitty, I love that mug! I also love scones, but rarely think to make them. Thanks for sharing with SYC. What a beautiful cozy setting! Your mug is really adorable and looks perfect with your delightful setting for tea~I wish I had a scone or waffle to munch on right now and the jam sounds like heaven! Beautiful setting and the scones look delicious! Love that mug. Lovely vignette. Such a pretty mug. What an inviting tea. Loving red lately. Happy SYC!